“What a gift, a magnificent gift to experience Israel exactly as we all are – through and through as authentically Queer people.” – Broch, Seattle, WA. Just a few weeks ago, 22 LGBTQ Jews from around the world, current and future community leaders, joined A Wider Bridge on our third annual LGBTQ journey to Israel, and these were among the many powerful words participants used to describe the experience. We traveled to the desert, climbed Masada, and swam in the Dead Sea. We explored the boulevards of Tel Aviv, learning the history of the city that gave birth to the modern state of Israel. We traveled to a kibbutz in the far northern reaches of the country, and ended in Jerusalem, where we walked the narrow streets of the Old City and we prayed, danced, sang and cried at the Western Wall. 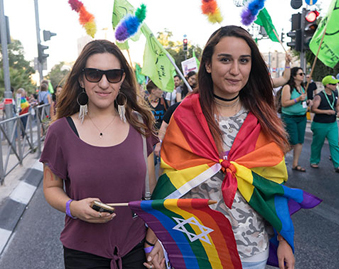 All along this 10 day trip, participants got to see first-hand the diversity and richness of LGBTQ life in Israel. We met with LGBTQ political leaders, and with the leaders of the most prominent LGBTQ organizations in the country, focused on areas such as LGBT rights, education, social services, transgender empowerment, teens and parents, religious acceptance and culture. We had an evening with LGBT musical performers, and an evening of short films, meeting with up and coming LGBT film directors. We had a book reading with a leading gay Israeli author, and we experienced the fun LGBT nightlife of Tel Aviv and Jerusalem. We met with many young, out and proud LGBT community members, and we met Mordechai and Ariel, two men in their 80s, who have been living together as lovers in Jerusalem for 55 years. One message was clear throughout the trip: there is a place for us in Israel, and we can help to make a difference. Our group was young, yet inter-generational, and global. Our diversity was enriched by our transgender participants and by Jews from all streams of Jewish practice and observance. Together, we created community. 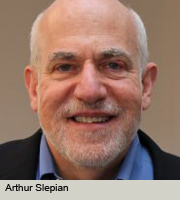 We told each other our stories, discussed our experiences and formed bonds of friendship that still connect us. If there was a common theme in our stories, it was a desire to be whole, to be our queer selves and our Jewish selves together, with pride in all of it. And a sense of great joy that we could find a taste of this wholeness in Israel, our people’s homeland, with a new community of friends. I think three years qualifies this trip as a tradition, and we hope many of you will join us in 2014. Dates and details coming soon! 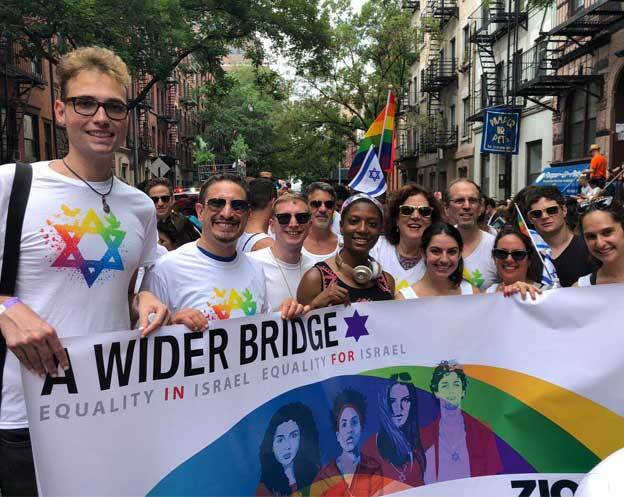 As Hanukkah approaches, A Wider Bridge rededicates itself to the work of bringing LGBT Jews closer to Israel, and bringing our global LGBTQ Jewish communities closer together. May the lights of the season illuminate our path.